The automated gate operator is the core of an electric gate system; without the right leverage and power, all the accessories in the world won't make the automatic gate operate properly. It is essential to take into account the length of the gate, hinge design, wind resistance, and more. DIY Gate Openers gives homeowners the tools they need to choose exactly the right electric gate operator, with detailed descriptions and a Virtual Yard designed to offer recommendations and virtually visualize the proposed setup. And, we offer a myriad of gates for a variety of specific needs. Furthermore, Estate Swing carries automated gate openers with enough strength to handle ornate electric gates, as well as those that are gentle enough for vinyl gates. With all these options, and the information necessary for an educated decision, DIY Gate Openers is the premier online store for driveway security gate openers. DIY Gate Openers knows its customers will have very specific, individual needs when it comes to entry options for their automatic gate openers. Perhaps the electric gate is just to keep out pesky deer or other wild animals - we have remote and automated entry solutions like photo eye and exit/entry wand combinations. Maybe the gate is designed for a more secure property - we have keypads and intercoms to allow guests and deliveries while maintaining a secure perimeter. Estate Swing recently presented the first GSM Wireless Intercom in the US, which is the ultimate combination of security and convenience. All of these options means exactly the solution needed for each individual situation. DIY Gate Openers knows its customers will have very specific, individual needs when it comes to exit options for their automatic gate openers. 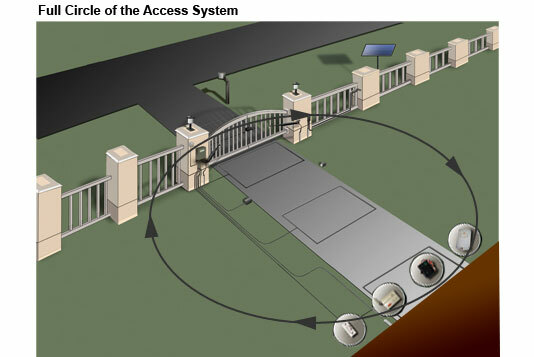 Perhaps the electric gate is meant to keep in children and pets - we have remote and automated exit solutions like photo eye and exit/entry wand combinations that allow convenient exit options for vehicles, but which lessen the likelihood of either motion or metal alone engaging the automated gate opener. Estate Swing was the first to offer wireless transmitter/receiver photo eyes in the US, demonstrating its leadership in innovations. Maybe the gate swings in and doesn't allow room for sensors - install a keypad. All of these options mean exactly the solution needed for each individual situation. DIY Gate Openers understands that homeowners who install electric gate openers are concerned with safety and security. We put safety as our ultimate priority, and to this end, we offer a number of brands that share our dedication, including Estate Swing. Estate Swing automated gate openers are designed so the safety measures function on a normally closed circuit; if the safety functions are not engaged for some reason, the electric gate operator will not engage the gate. Driveway security gates that do not have this design will operate regardless of whether or not the safety functions are working properly, so the homeowner may not know of the risk. DIY Gate Openers doesn't believe in taking risks with the safety of loved ones or property. It is because of this that we also offer a variety of safety accessories including photo eyes, shadow loops, intercoms (including the revolutionary Estate Swing GSM Wireless Intercom), and automatic gate locks. And our Discount It Yourself packages make it easy to add the safety accessories you need at the price you desire. Using our gate opener system tool is free and easy. Our tool will virtually build your gate opening system before your eyes, it will be easy to see and understand how components work together and how items with the same function differ from each other. This tool will help you create the perfect system for your home. Feel free to use this system no matter who you buy your system from. Right now you are scolling over the virtual yard tab, get started selecting this tab and answering a few simple questions about your property. The answers to these questions will help us eliminate openers that don't match your usage. As you follow the tabs your yard and gate opening system will be illustrated for you in our "virtual" yard. DIY Gate Openers knows that homeowners want the most versatile energy options for the most effective powering of any automated gate opener. We offer solar ready models for the economically concerned and ecologically aware. We also carry a variety of electric gate operators that offer options for extended distance from gate operator to power source. Additionally, Estate Swing was the first in the US to present low-voltage gate opener systems that could function as constant duty electric gate openers, making Estate Swing a leader in power innovations. This allows the safety and cost effectiveness of a low-voltage system with the power to handle consecutive cycles. Finally, DIY Gate Openers carries extra batteries so homeowners can have the additional power, as well as larger control boxes for deep cycle marine batteries which are capable of holding a bigger charge. DIY Gate Openers believes that do-it-yourself installers can install a completely automated gate opener system to suit exactly their needs without compromising functionality for price. We provide the scaffolding to support the DIY installation by breaking down a gate opener system into five categories: Gate Openers, Entry, Exit, Safety, and Power. These categories allow the homeowner to examine their needs in a logical progression. Other stores break down a gate opener system by types of products, which means property owners need to sort through pages of descriptions to figure out which products suit their needs. In addition to our innovative product categories, we have a Virtual Yard that can suggest products to suit the needs determined by the survey, or those products that are compatible with the selected electric gate operator. The Virtual Yard lets customers see how the products will look on their property, which is a revolutionary concept to assist those customers who understand information better visually. Finally, our DIY (Discount It Yourself) packages are designed to recommend products that are compatible with the selected automated gate opener. Unlike other packages, though, the homeowner gets to decide exactly what they want in a package. Choose products that suit specific, individual needs and save money by eliminating all the extras.